Look out, there's a zombie right behind you. No seriously, it's right behind you. Although the App Store has no shortage of zombie-themed video games, none are scary per se. The undead look the part, and developers have done a fine job creating bleak post apocalyptic environments, but at the end of the day, we can go to sleep at night, fully aware that all those mysterious sounds have nothing to do with bogey men in closets of critters scampering underneath our beds. It's just the weirdo next door, who's creepy on a whole other level. With this in mind, Naquatic deserves a nod for instilling a genuine sense of dread in its iPhone and iPad release, Affliction: Zombie Rising. There's little in the way of depth, and the threat of accidentally dropping one's device while playing or, at the very least, growing dizzy is real, but for a buck, we'll happily splatter zombie brains while the hairs on our arms stand up. 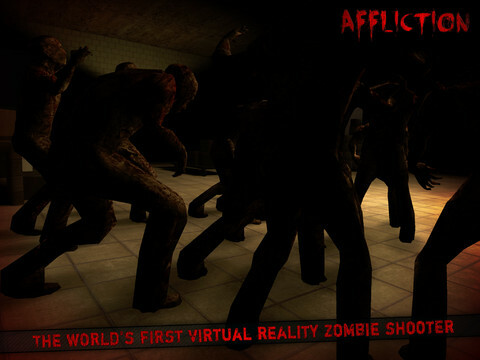 That said, Affliction: Zombie Rising is a first-person shooter, except you can't move the unnamed character in a specific direction. Instead, you control the camera by physically tilting your smartphone/tablet or using a virtual stick. Go with the gyroscope, and you'll need to stand up and actually spin around 360 degrees. Opt for the stick, and you can sit lazily on the couch. Personally, we always choose the motion controls, as this setup provides pinpoint precision accuracy at all times, whereas the thumb stick is much too jerky for our tastes. 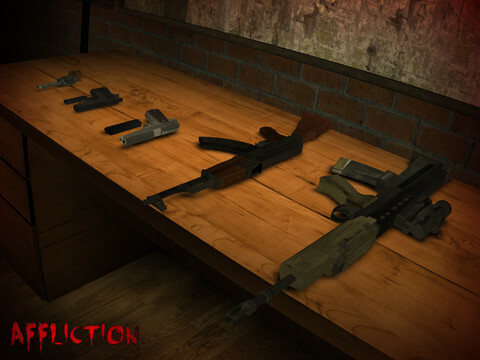 With that out of the way, you're stuck in a warehouse being overrun by zombies, and must survive waves of progressively difficult creatures using one of four weapons, all of which differ in damage, range and ammo. There's a Leopard Magnum that holds six bullets, a PP8 Pistol with eight, a DD45 Verokot that holds 12, and finally, the fully automatic AKF8 with 20 rounds; you can purchase guns, or unlock the weapons by surviving specific waves. Upon choosing a weapon, the real fun begins. You sit in almost total darkness, aside from a bit of light from your flashlight. The goal, meanwhile, is to seek out zombies shambling their way towards you and put those suckers down by tapping the screen. Naturally, a headshot is the most effective means of disposal, and things work out quite well during the first couple of waves. Before long, though, the developers ratchet up the difficulty, forcing you to spin around like mad as zombie groans fill your ears; you absolutely must play this game with headphones or the volume up. What makes the game especially unnerving are the zombies you don't see, as well as the ones you see when it's too late. You'll quickly move left, only to find a horribly-rotted face staring right back at you. It doesn't help that the music intensifies the closer you are to death, as your health, represented as a biohazard symbol, slowly disappears. To that end, Affliction: Zombie Rising provides a few hours of fun, especially if you aim to dominate the Game Center leaderboards. At the same time, we can't help but feel there's lost potential. You never leave the warehouse, for starters, and all the zombies look the same. On top of that, we ran into a nasty bug that crashed the game after we switched from gyroscope to thumb stick, forcing us to restart. The problem corrected itself, but Naquatic should fix that immediately. Where does this leave Affliction: Zombie Rising? Somewhere in the middle, as far as good and bad zombie games go. We enjoy pulling it out for a quick match of survival, but there's simply not enough meat on this title's bones to warrant long-term appeal, and there doesn't appear to be a thriving community willing to hop online for two-person co-op, but as far as intense iPhone and iPad games go, it's right up there. What's Hot: Excellent gyroscope controls, giving players the option to unlock or purchase weapons, does a great job building tension. What's Not: The occasional crash, all zombies look the same.